Once you have selected a style for your kitchen you can start piecing together various elements to achieve the dream room you've always envisioned. We've included a style guide consisting of photos that convey those design elements and characteristics typical of a particular style. All beautifully designed rooms have one thing in common - attention to detail. It's the details, small and large, that bring harmony to a design, and define it. To create a space you will love for years to come start first by identifying the style you desire, then research the elements that truly define that style. Here are four of the most common kitchen designs styles. Overall Characteristics: The overall look of a traditional kitchen is formal or classic. Incorporate fine, richly stained woods with red tones and or deep historic colors. White is also popular. Glass doors are often used on upper cabinets to display fine dinnerware and service pieces. Heavy architectural details play a major role in overall design. Cabinets: Raised panels and rich woods, mahogany, cherry, white and deep historic colors. Architectural details are typical including crown moldings, fluted casings, corbels, scrolls, embellishments and glass doors. Detailed and decorative hardware. Surfaces: Polished granite, honed granite or marble, quartz, porcelain, ceramic tile and woods. Hardware: Polished chrome, polished or brushed nickel, pewter or oil rubbed bronze. Style variations include Early American, Georgian, English, Southern and Old World. Need inspiration? Check out our Traditional board on Pintrest. 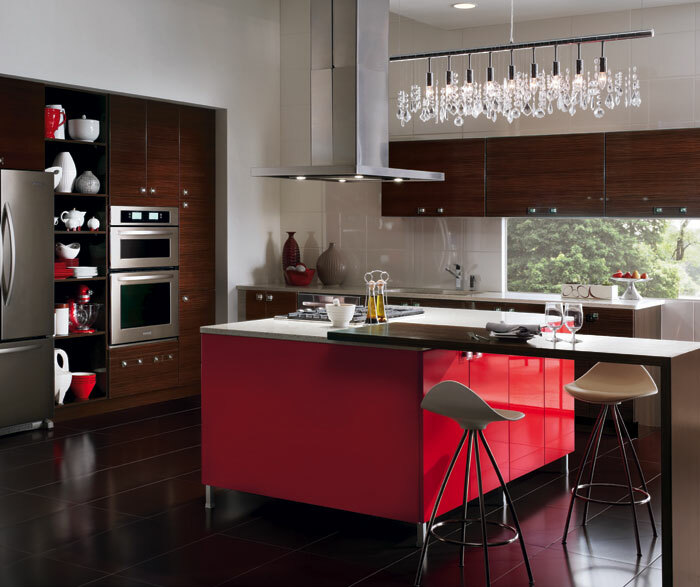 Overall Characteristics: Contemporary kitchens have understated, simple styles that are free of ornamental details. The focus is on form and material, i.e., slick textures, geometric shapes, curvilinear forms and scale. Lines are straight with abrupt angles. Colors vary from neutrals to contrasting blocks of color. Surfaces are hard, smooth and sleek. Cabinets: Common door styles include full overlay, flat panel, straight lines and edges. Finishes are high gloss or matte. Colors range from bold solids, black, white or gray. Low grain or exotic woods with unique grain patterns are pale or very dark with minimal hardware. Surfaces: Smooth and sleek. Stainless, glass, concrete, granite, marble, quartz and acrylics. Exotic stones in honed or glass finishes. Hardware: Popular styles are polished chrome, polished nickel and brushed nickel. Need inspiration? Check out our Contemporary board on Pintrest. Overall Characteristics: The overall look of country kitchens is warm, aged and lived in. Incorporate natural, raw materials such as bare woods, slate, aged copper, iron, clay and honed stones. For colors, balance muted hues and earth tones with bright primary colors. Cabinets: Heavy grained woods in pine, maple or oak with dull finishes or painted with distress, crackle or washes. Raised panels with worn smoother edges and subtle, aged architectural elements. Surfaces: Worn, aged, rugged, brushed and matte. Limestone, quartz, slate, aged copper, granite, marble, knotty worn woods, wainscoting and bead board. Hardware: Brushed and antiqued nickel, pewter, copper and oil rubbed bronzed. Style variations include: Olde World, South Western, French Provincial and English Country. Need Inspiration? Check out our Country board on Pintrest. Overall Characteristics: Transitional kitchens don't commit to one style. They are typically a bridge between contemporary and traditional. This kitchen design gives you the option to change the look over time. Lines are minimal, but simple details may be added. Cabinets: Beaded or flush insets, full overlay with recess panel doors. Finishes are variations of white paint and stained woods. Surfaces: From polished to honed - most styles apply. Hardware: Choose hardware that goes with the style you are leaning to at the moment. Hardware can easily be changed over time to freshen or alter the look. Popular styles are polished chrome, polished nickel and brushed nickel. Need inspiration? Check out our Transitional board on Pintrest.